Good morning Clemson Girls! We are halfway through the week and only two days away from a big home game Saturday against Georgia Tech. Back in August, we introduced you to one of our newest sponsors Shucks Pearls, a division of Yonderways, LLC. Shucks Pearls created the Tiger Pearls - freshwater tiger striped pearls in Clemson orange and purple. You can buy the Tiger Pearls as necklaces, bracelets, earrings and more. 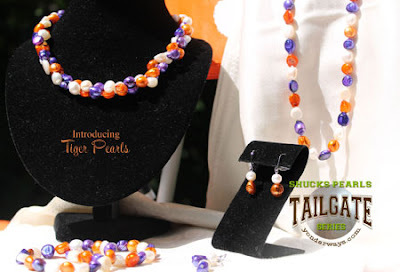 Shop Yonderways.com for Shucks Tiger Pearls, use coupon code 'clemsongirl' and get FREE shipping. 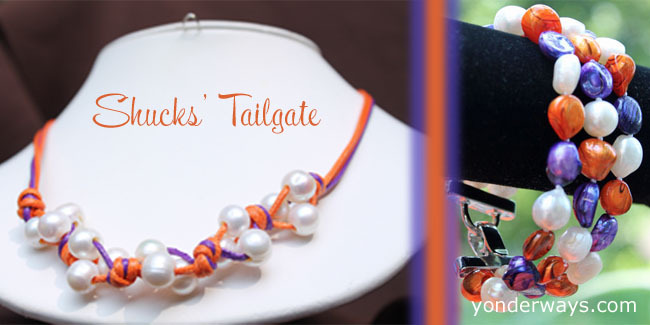 Today Schucks Pearls would like to give one very lucky Clemson Girl reader a piece of their Tiger Pearls jewelry line. The winner will get to choose between Orange & Purple Tailgate Necklace or the triple strand Tiger Pearls bracelet - either would be a great addition to your gameday jewelry collection. Deadline for all entries is tonight at midnight. We will draw a winner at random and contact the winner by email. The winner will have 48 hours to contact us after we send the email or we will draw a new winner. Thanks to Shucks Pearls for sponsoring today's giveaway! Good luck ladies!